The AB Trust was very popular because it effectively doubled the amount a married couple could protect from the Federal Estate Taxes at death. For those of you that are unfamiliar with the estate tax, it is a tax that the government places on your assets when you pass away. The bad news is the tax rate is currently 40% which is quite high considering this tax is applied to assets on which income tax has already been paid. The good news, however, is that the government allows each person an exemption which they can use to protect a certain amount of their assets from estate tax upon their passing. In the 1990’s, that amount was, at one point, $600,000 per person, which meant that a person with a $1,000,000 estate could pass $600,000 to his loved ones free of estate taxes, while the remaining $400,000 would be taxable at the going rate (at that time, it was 55%). Due to the Bush Era Tax Cuts and subsequent legislation, the current exemption amount is now approximately $5.3 million per spouse. Given the large increase in the amount an individual can protect from government taxation at death, the AB Trust has become inappropriate for a significant segment of the population, as a single spouse’s exemption is now enough to protect the estates of most Americans. The increase in the estate tax exemptions have greatly reduced the need for a second exemption to be preserved by the AB split. As such, I encourage my clients to review their trusts and the various options available to them. Doing so could mean saving a significant amount of time, effort, money and sleepless nights. If you think you have an AB Trust, it is highly advisable that you speak with your estate attorney about whether or not this structure is still appropriate given your situation. In addition, even if you do not have an AB trust, it’s a good idea to get into the habit of reviewing your estate plan with your attorney every 3 to 5 years to ensure that your plan is not adversely affected by other changes in the law or your personal situation. Brian Y. Chou, Esq., MBA is an associate at the law firm of BarthCalderon, LLP in Orange, CA. 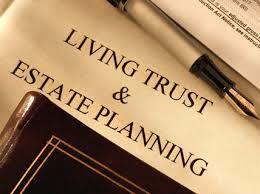 His practice is focused on estate planning, asset protection and business succession planning. This entry was posted in Estate Planning, financial planning, living trust, Planning by Matt@DearMrMarket.com. Bookmark the permalink.